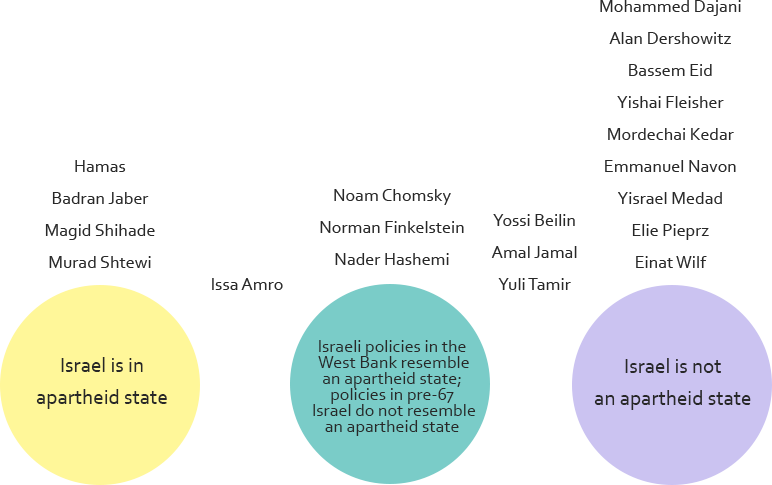 Apartheid – Where Do We Stand? According to Merriam-Webster, “Apartheid” is a former social system in South Africa in which black people and people from other racial groups did not have the same political and economic rights as white people and were forced to live separately from white people.” Some people apply this label to Israel with regards to some of its policies, particularly in the West Bank. It mainly stems from the different sets of laws that are applied to Israelis living in the West Bank with Israeli citizenship and the Palestinians living nearby. Discussions focused on whether they would label Israel an apartheid state. Below are the participants’ approximate location on the issue based on their responses. When their responses did not fit exactly under one category, they were placed in between the two categories at a place which most closely resembled their stances. Occasionally, their placement represents what they think should happen rather than what they want. Click the name to see what they had to say.